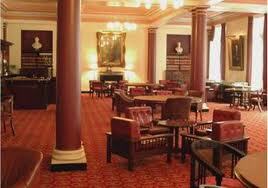 The Athenaeum originated as a gentlemen's club in Liverpool, England. It has been in continuous use since the end of the 18th century. The club was founded to ensure the up-to-date provision of newspapers and pamphlets, and to create a library for the use of the merchants and professional men in the city. The original building was demolished, and replaced by a new building nearby, in 1924. The members of the club are known as Proprietors, and they include both men and women. The building contains a large library, and it is also used by the Proprietors for social functions. It can be hired for use by outside individuals and organisations. The club was founded on 22 November 1797. Towards this date, Liverpool had been growing rapidly as a commercial centre. The merchants and other professionals in the city needed a supply of up-to-date news. This was usually provided by newspapers and periodicals in coffee houses, but these were frequently overcrowded. There was also a need for a library because the existing library, founded in 1758, was not considered to be adequate. The founders of the club produced a prospectus entitled Outlines of a Plan for a Library and Newsroom, which proposed "to procure a regular supply of newspapers, both town and country, all the periodical publications of any value, and all the pamphlets that have reference to subjects of local or general polity or commerce". They commissioned the local architect John Foster to design a building for them in Church Street.This opened on 1 January 1799, and its library opened on 1 May 1800.The early members of the club included "entrepreneurs, slavery-abolitionists, free-thinkers, and political radicals, who regarded themselves as the commercial and intellectual champions of Liverpool".